You may have experienced this before: You’re sitting comfortably watching your favorite reality show and munching on some snacks when suddenly, OUCH! What was that? Did something break? It feels o.k. now. But every once in awhile the same feeling. Sound familiar? You may have “cracked tooth syndrome”. This is one of the most common oral conditions we see in dentistry and also one of the most difficult to diagnose, isolate and treat. Most teeth have some evidence of cracks or craze lines running through them. In most cases these are minute fracture lines that run through the enamel layer and can be reflective of the stress and strain placed on a tooth and differences in the coefficients of thermal expansion that can be found between the dentin and enamel layers. If asymptomatic and unless clinical impression dictates otherwise, these sites are generally able to be monitored with no treatment indicated. However, in combination with symptoms or if present on a functioning surface of the tooth or immediately adjacent to a restoration, the site may need to be attended to. Cracked tooth syndrome is usually identified through particular symptoms that the patient describes. Often times this includes a sharp pain when biting down or when releasing the bite and most patients describe a non- lingering discomfort that dissipates quickly. The tooth can also exhibit a discomfort to hot and cold stimuli or sweets. In some cases, the pain is constant and can mean that the nerve of the tooth is involved. *Habits such as chewing on pencils, ice, hard candies, etc. *The weakening effect of a root canal on a tooth. To determine if a tooth has a crack present, the dentist will examine the tooth and try to visualize the break. The dentist may then place an instrument on one part of the tooth at a time ( the “tooth sleuth”) and have the patient apply some pressure to elicit a response. A radiograph ( dental x-ray) may also be used, although my experience has been that the “everyday” crack in a tooth is usually not identified this way. 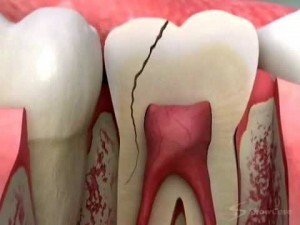 If there is a crack, what will happen to the tooth? If left alone the crack will continue to be symptomatic until either the piece breaks off, in which case the tooth is repaired if possible, or the nerve of the tooth dies. If the nerve dies, the tooth will need a root canal to remove the dead tissue and subsequently a restoration to rebuild the fractured piece. Can the tooth be “fixed” before this happens? The answer is…it depends. Many cracked teeth can be repaired if the crack is above the gum line. The trouble is determining where the crack is precisely. If the crack cannot be visualized, and most cannot, then even after restoring the tooth there will still be a risk of tooth loss. The dentist may try to crown the tooth and this might solve the problem. Other times a root canal may provide relief. For some patients, however, the tooth may still be symptomatic and may need to be removed. The rule of thumb is that when dealing with a cracked tooth there are no guarantees of outcome.